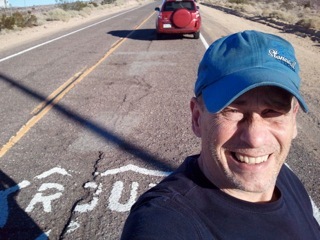 In the fall of 2010, I retraced the road trip John Steinbeck made for his bestseller “Travels With Charley.” Along with posting blogs to “Travels Without Charley” at the Pittsburgh Post-Gazette, I took nearly 2,000 pictures of America and Americans. I took snapshots of people I met, places I went or things I thought were interesting, pretty, funny or stupid. I photographed many places Steinbeck mentions in “Travels With Charley” as well as hotels and homes he stayed at while on his 1960 journey. Some of my photos are pretty good, some are blurry or kind of crazy. Many were taken through my car windows at 70 mph. 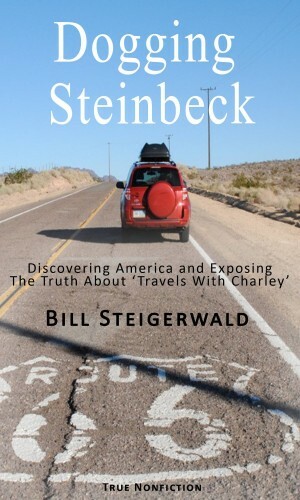 Collectively they help me tell the true story of “Travels With Charley” and provide a hint of the beautiful country and good people I saw on my high-speed dash down the Steinbeck Highway. Here are some photos from Stonington, Maine, where Steinbeck visited in late September of 1960 and I visited in September of 2010. It’s not hard to see why Steinbeck flipped over Stonington, Maine. Its main street is on the harbor’s edge. Boyces Motel on Main Street has rooms with and without a view. Homes hang over Main Street and look to the sea. Lobster fishermen and their gear are everywhere. 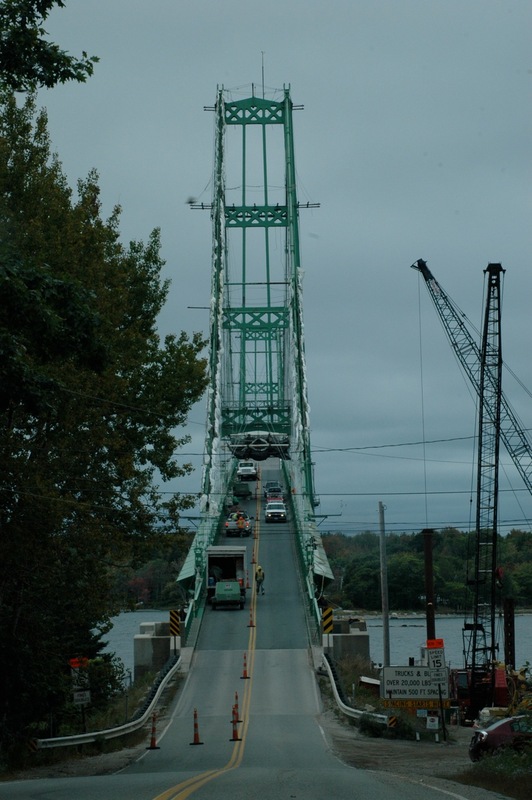 Here are some photos from Bangor to Deer Isle, Maine, which is about 50 miles south of Bangor on the Atlantic coast. On the road from Bangor to Deer Isle: Maine culture in one picture. property of a beautiful house by the sea owned by Eleanor Brace. The only bridge from the mainland to Deer Isle. Steinbeck stayed two nights, gave me directions to the house. two nights, then drove north to the top of Maine. Lancaster, N.H., through them to Bangor and then to the Maine coast. Neither have many of the crossroads. “Charley,” but I spent my first night at a Walmart there. Steinbeck stayed here in the fall of 1960, probably Sept. 25. The Spalding Inn is in the White Mountains near Lancaster, N.H., where Steinbeck said he camped on a farm but didn’t. coat and tie to meet the dress code. Here are some photos from Lancaster, N.H., on a Saturday in September, 2010.
going east to Maine and west to Chicago. A farmer’s market in Lancaster, N.H., on Sept. 25, 2010. Steinbeck didn’t sleep by the Connecticut River, but I did on 9/25/2010. 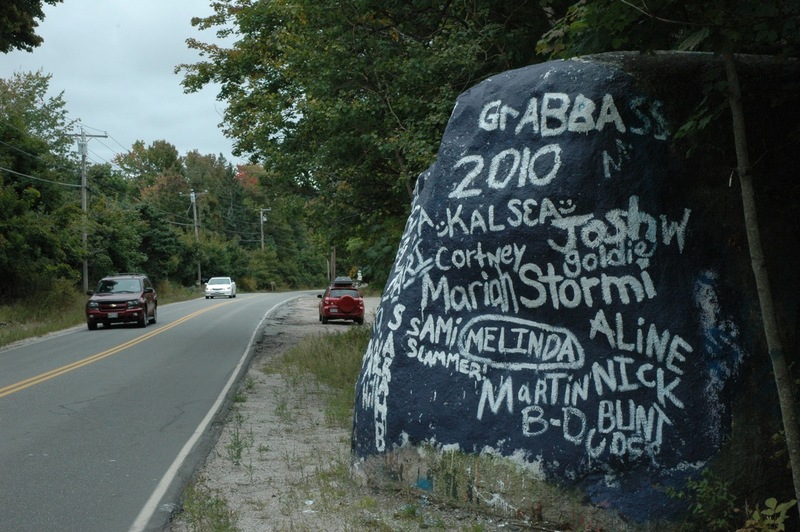 A sign of the Tea Party in September of 2010 in northern Vermont. Steinbeck's first two sleepouts in his camper shell were on a dairy farm above his kid's exclusive boarding school in Deerfield, Mass. The farmhouse was vacant but still in great shape on Sept. 24, 2010. But the barns and fields of the farm were being reclaimed by nature and in the orchard the apples were rotting on the ground..